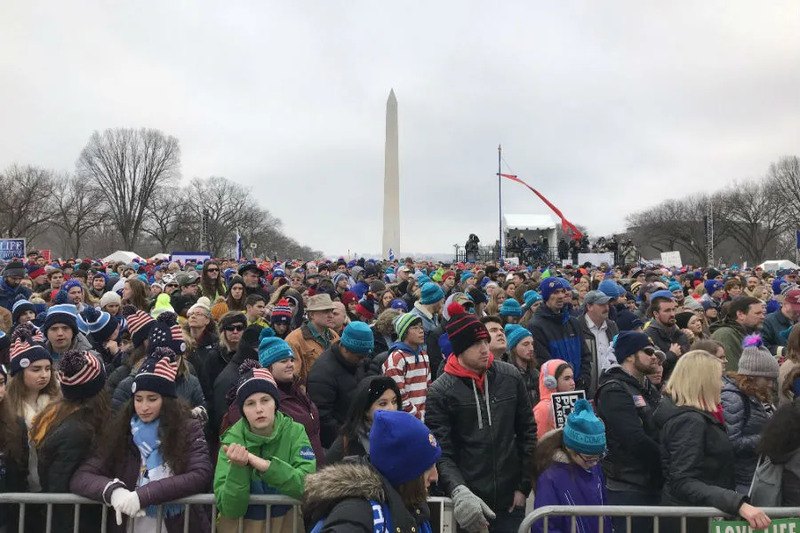 Washington D.C., Jan 19, 2019 / 04:00 pm (CNA).- Attendees at the 2019 March for Life saw an unannounced appearance from Vice President Mike Pence, a video message from President Trump, a strong bipartisan speaker line-up, and secular science theme. But the most surprising sight of the day, at least for 12-year-old first-time marcher, was the number of children. “There are more kids here than adults!” said Angela from Rockville, Maryland. The March, held Friday, traced the annual route along the National Mall in Washington, DC. It was the Dillers’ second march as a family. Their group of 14 included the Diller brothers, their wives Robin and Lisa, and their collective ten children. The crowd did not intimidate even the smallest Diller, a 10-month-old blinking out from Mr. Diller’s chest, zipped into his dad’s jacket for warmth. Though often labeled “anti-abortion,” people like Mary Bonk from Lexington Park, Maryland, think of themselves as marching for many different life issues– not just against abortion. Bonk adheres to the consistent life ethic, which opposes all forms of violence against the human person, including things like war, torture, embryonic stem cell research, and the death penalty. Krista Corbello and Alex Seghers, 26-year-olds from Pro-Life Louisiana, shared Bonk’s expansive sense of what it means to be pro-life. 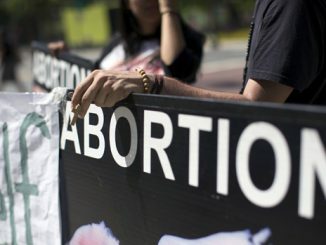 One such change is the growth of “pro-life feminism.” Seghers identified herself and her unborn daughter as pro-life feminists: “She’s marching before she’s even born.” To them, pro-life feminism means advocating nonviolence and nondiscrimination for all people, including those in the womb. These women appear to have struck a nerve with their inclusive message: their group brought 1,500 young people to D.C. for the March this year. Family is a common theme among young people at the March. Though many of them march for religious, political, and educational reasons, almost all point to their families first when asked about their interest in pro-life issues. Taylor began volunteering at a crisis pregnancy clinic in college after learning about her mother’s near decision to abort her. The Turcotts see their advocacy, especially the March, as an opportunity to share their gratitude. Friday’s crowd was full of extraordinary stories like the Turcotts. One woman, Francis Reciniello, has attended the March for over 30 years. As an immigrant from Honduras, she said she had never supported abortion because it was antithetical to her culture and upbringing. So when a friend got pregnant in college, Reciniello offered help and begged her to choose life. It worked. “She told her boyfriend and he married her, and they named their child ‘Francois,’ after me” Reciniello said. Perhaps the most extraordinary part of the March for Life was that the thousands of people who attend each year think of their peaceful activism, loving families, and joyful sacrifices as ordinary. “This is just, like, normal,” said Garrett, a high school student from Philadelphia, about being young and pro-life. “It’s how we grew up.” His classmates Evan, Miguel, and Charlie nodded. New York City, N.Y., Mar 1, 2019 / 12:15 am (CNA).- New York police officials have declared an act of vandalism against a statue at a local Catholic church last week to be a hate crime. Baltimore, Md., Feb 22, 2017 / 02:11 pm (CNA/EWTN News).- Both Pope Francis and St. Francis of Assisi provide the right perspective on caring for creation in a way that places care for humanity at its center, said Archbishop Wilton Gregory of Atlanta. Washington D.C., Jan 23, 2017 / 11:24 am (CNA/EWTN News).- Religious leaders gathered in prayer for the country and the Trump administration on Saturday, continuing a decades-old tradition of national prayer at the start of a new presidential term. The news on our TV station barely mentioned the March for Life, though they covered the women’s march. Yesterday the one thing they *did* cover was the students from Covington Catholic school who allegedly “confronted” and “taunted” and “mocked” and American Indian who was drumming and chanting. Indignation expressed, and it seems that the school has apologized and threatened the boy in question with expulsion. It’s sad that the school and the diocese immediately condemned the children without, it seems, bothering to listen to their side of the story. Yes, totally agree. When I first saw this vid posted it just didn’t seem right, so dug a little further and found the longer version. So obvious boys were not at fault at all. They were heroic in the face of the abuse they put up with.